Young genes and genes under positive selection commonly contribute to adaptive phenotypic evolution. Early developmental stages are very important for establishing phenotypes, which might be helpful for studying the evolutionary patterns of these rapidly evolving genes. Here, we performed a weighted gene co-expression network analysis to identify modules of co-expressed genes at different stages of Drosophila melanogaster development. We found that young genes, including duplicated, orphan, and young lncRNA genes, are significantly enriched among modules associated with specific developmental stages. In addition, genes undergoing rapid amino acid sequence evolution driven by positive selection showed a similar proportion of essentiality with other genes, and enrichment in modules for specific developmental stages. Our integrative analysis revealed important roles for the origin of new genes and rapid amino acid sequence evolution in development that may account for specific phenotype evolution in Drosophila melanogaster. Evolutionary biologists have long sought to understand the molecular genetic basis of phenotypic evolution. Britten and Davidson proposed that regulatory mutations play a crucial role in phenotypic evolution from their observations that a substantial proportion of repetitive sequences regulate expression in genomes . A pioneering study by King and Wilson found that the degree of divergence in protein sequences cannot account for the phenotypic differences between human and chimpanzee, and proposed that the evolution of anatomy was influenced to a greater extent by changes in gene regulation than by changes in protein sequence . Recently, Carroll has put forward the proposal that the evolution of animal morphology is mainly attributable to mutations in the cis-regulatory regions of genes, instead of mutations in their protein-coding regions -. With the advent of large-scale genomic data, the role of positive selection in the evolution of protein coding sequences involved in phenotypic evolution is now known to have been underestimated. For example, the coding sequences of many genes involved in the development of the human brain have been shown to have evolved under positive selection, which may account for the rapid evolution of the human brain -. Adaptive changes in the amino acid sequence of MC1R account for pigment adaptation including variations in skin and hair color in many species . Genome-wide surveys of polymorphism in humans have estimated that >10% of the amino acid substitutions in sequences that occurred between humans and chimpanzee may have been adaptive ,. During short-term evolution within species, most mutations that cause morphological variation have been found in protein-coding regions . In contrast, during the long-term evolution between species most mutations that cause morphological differences have been found in cis-regulatory regions. It has been proposed that this difference in abundance of coding and regulatory mutation in morphological characters is due to coding mutations within species not being able to spread through populations due to their pleiotropic deleterious effects . New genes also provide crucial material for evolutionary innovations. Accumulating evidence supports the remarkable phenotypic effects of new genes in development -. For example, a pioneering study by Chen et al (2010) found that many new genes rapidly evolve to gain essential functions in Drosophila, since knockdown experiments of many of these new genes by RNA interference (RNAi) leads to lethality at various development stages. It was also found that some of these new genes have important functions in the process of organogenesis in Drosophila . A functional association between new genes and newly evolved brain structure was observed in humans , and Drosophila . In the human genome many new genes appear to have been recruited to function in the development of the brain ,,,. Evolution of phenotypes is mainly determined by changes that occur in developmental processes. Examination of evolutionary changes occurring in genes expressed during development should be helpful for understanding the roles of genetic innovation in phenotypic evolution. Here, based on an analysis of gene co-expression networks at different developmental stages, we describe important roles for new genes, and rapid amino acid sequence evolution in genes, in development that might be responsible for specific aspects of phenotypic evolution in Drosophila melanogaster. Transcriptomes from early developmental stages and diverse adult tissues in Drosophila melanogaster studied in  were used for identifying new transcripts and calculating the expression values for genes (see Materials and Methods, Additional file 1). Genes involved in the same biological process tend to have expression levels that are highly correlated across samples. Identification of groups of co-regulated genes, or “modules”, should be informative for identifying specific features of developmental stages/tissues/cells. We implemented a weighted gene co-expression network analysis (WGCNA)  to identify modules of co-expressed genes during different stages of development in Drosophila melanogaster. This approach has been successfully employed to deduce regulatory networks in the developing human brain ,. Here, a total of 46 coexpression modules (labeled numerically, e.g., M29, and by color, e.g., black, see Additional file 2) were obtained for Drosophila development. Many of the modules were developmental stage-specific (Additional file 3), for example, M2 is correlated, with high significance, with the 2-4 hr embryonic developmental state (P = 5e-42), and M39 is strongly correlated, with high significance, with adult females 30 days after eclosion (P = 2e-10). The Bristle Screen online database  was used to search for essential genes (here, a gene was deemed as essential for survival if it was completely lethal with constitutive RNAi). This database contained 20,262 transgenic RNAi lines that are predicted to target 11,619 of the 14,139 protein-coding genes (82.2%) in release 5.7 of the Drosophila genome. Lethality described in this database included several categories: completely lethal (no adults of the desired genotype, 1803 lines); some lethality (adult “escapers” had no obvious phenotype, 506 of lines); and lines that showed some phenotype with the accompanying lethality (1,230 lines, 1,069 genes). Of the 15,379 Drosophila reference genes present in our modules, 10,753 were included in the 18,663 lines with knock-down data in the Bristle Screen database, with 1,237 genes (in 1,655 lines) showing completely lethality (~8.868%). The analysis was then expanded to include all of the genes (i.e., not just reference Drosophila genes) represented in our modules. A total of 11,632 genes, represented by 20,262 RNAi lines, from the Bristle Screen database, were represented in our modules, with 1,339 of the genes (from 1,803 lines) showing complete lethality (~8.898%). From this analysis, three modules, M17, M6 and M28, were identified as being significantly enriched with lethal genes (P = 1.84E-22, P = 3.61E-62 and P = 1.03E-22, respectively, by the χ 2 test, after FDR correction) (Figure 1A). Expression of genes in module M17 are significantly associated with the white prepupae (WPP) stages (P = 6e − 04, Figure 1B, Additional file 4), genes in module M6 are significantly correlated with the 0-2 hr embryo stage (P = 4e − 04, Figure 1C, Additional file 5) and genes in module M28 are significantly associated with the 10-12 hr embryo development stage (P = 0.01, Figure 1D, Additional file 6), revealing essential roles for these highly expressed genes in these developmental stages. The 0-2 hr embryo stage, i.e. the specific stage of module M6, is the maternal to zygotic transition period in Drosophila . Consistent with this period in development, gene ontology analysis revealed that genes in module M6 are enriched in biological categories associated with chromatin organization (P = 2.52e-37, after FDR correction), transcription (P = 7.40E-32, after FDR correction), cell cycle (P = 1.07E-29, after FDR correction), development (P = 2.88e-04, after FDR correction) and morphogenesis (P = 8.79e-04, after FDR correction) (Additional file 7). These data suggest an essential function for these genes in the maternal to zygotic transition period. Expression profile of completely lethal genes in each module. (A) Enrichment of completely lethal genes in gene modules. Stars identify modules with significant enrichment for lethal genes. (B-D) Histogram of the expression of genes in modules M17 (B), M6 (C) and M28 (D) and heatmaps of the expression of genes in this modules are seeing in Additional files 4 and 5. Expression of genes in each developmental stage was calculated as the expression in the stage divided by the sum of all stages. Mean expression and standard deviation (SD) of all genes in each stage are shown. We identified a total of 221 new genes including newly duplicated and young orphan genes (detailed in Material and Methods), specific to Drosophila melanogaster. We then identified which modules, and developmental stages, were enriched with new genes in Drosophila melanogaster. Significant enrichment in new genes was found in 6 modules, M41, M24, M37, M13, M36 and M23 (P = 7.34E-14, P = 1.56E-11, P = 3.52E-09, P = 5.56E-08, P = 8.18E-07, and P = 2.39E-04, respectively, by the χ 2 test, after FDR correction) (Additional file 8), where these modules are significantly correlated with WPP + 2 days Fat (P = 9e-37), stage L1 larvae (P = 1e-06, Figure 2B, Additional file 9), dark blue gut PS(1-2) in stage L3 larvae (P = 3e-15, Figure 2C, Additional file 10), 4 day post-eclosion testes in adult males (P = 3e-15), 12 hr post-molt stage L3 larvae (P = 4e-27) and 20-22 hr embryo stages (P = 1e-05), respectively (Additional file 3). Gene expression analysis of the new genes enriched in these six modules also showed consistent specific high levels of expression in their associated developmental stages, supporting potential roles of these new genes in these tissues/developmental stages (Additional file 11). PCA analysis (Principal Component Analysis) also found an inseparable relationship of the new genes with other genes in these modules, supporting the potential gene co-expression network (Additional file 12). Expression profile of new genes in each module. (A) Enrichment of new genes (including duplicated genes and orphan genes) in each gene module. Different symbols are used to show modules with significant enrichment for duplicated and orphan genes. (B-C) Histogram of the expression of genes in modules M24 (B) and M37 (C) and heatmaps of the expression of genes in this modules are seeing in Additional files 9 and 10. When we considered young duplicated genes, we found that young duplicated genes are significantly enriched in 7 modules, M37, M13, M24, M36, M23, M12 and M26 (P = 2.91E-06, P = 7.70E-06, P = 5.17E-05, P = 3.04E-04, P = 0.0013, P = 0.030 and P = 0.031, respectively, by the χ 2 test, after FDR correction) (Figure 2A) (Additional file 13), which are significantly correlated with the dark blue gut PS(1-2) in stage L3 larvae (P = 3e-15, Figure 2C, Additional file 10), 4 day post-eclosion testes in adult males (P = 3e-15), stage L1 larvae (P = 1e-06, Figure 2B, Additional file 9), 12 hr post-molt stage L3 larvae (P = 4e-27), 20-22 hr embryos (P = 1e-05), 4 days post-eclosion accessory glands in adult males (P = 4E-32), and 18-20 hr embryo stages (P = 2e-17), respectively (Additional file 3). These observations support the previously reported testis-bias in the expression of some new genes, and that the function of these new genes in the evolution of phenotypes is determined by their expression in specific developmental stages. However, since as more tissues (59 development stages and tissues) and unique highly expressed genes were taken into account, only 40 genes among the 137 young genes are enriched in the M13 module correlated significantly with the testes. In addition, the significant clustering of the young genes with different co-expression modules that correlate with different tissues/developmental stages also suggests that the young genes might operate in many different functional classes, and not only in the testis. For example, gene ontology analysis of these 5 modules with young genes revealed that genes in the module M23 are enriched in functions that are integral component of membranes (intrinsic to membrane) (P = 0.0038, after FDR correction) and that genes in the module M24 are enriched in the aromatic amino acid family metabolic process (P = 0.035, after FDR correction) and the oxidation reduction process (P = 2.24E-07, after FDR correction), revealing potential functions for these new genes in these processes (Additional file 14). Our searches identified 84 young orphan genes that show no homology with proteins in other species (and were not duplicated in the D. melanogaster lineage). 83 orphan genes were significantly enriched in 6 modules, M13, M37, M24, M36, M41 and M40 (P = 0.021, P = 0.0077, P = 3.02E-07, P = 0.0096, P = 2.88E-22 and P = 0.0052, respectively, by the χ 2 test, after FDR correction) (Additional file 15, Figure 2A). Among these six modules, M13 is correlated with 4 day post-eclosion testes in adult males (P = 3e-15), M37 is correlated with dark blue gut PS(1-2) in stage L3 larvae (P = 3e-15, Figure 2C, Additional file 10), M24 is correlated with stage L1 larvae (P = 1e-06, Figure 2B, Additional file 9), M36 was correlated with 12 hr post-molt stage L3 larvae (P = 4e-27), M41 is corrected with WPP + 2 days Fat (P = 9e-37), and M40 is corrected with Mixed Adult Male and Female Carcass 4 days Post-eclosion (P = 2e-06) (Additional file 3), suggesting that these new genes have roles in these stages of development. The young genes were then queried against the Bristle Screen online database  where we found that among the 111 young duplicated genes (from 181 lines) having knock-down data, 4 genes (from 6 lines) were completely lethal (Additional file 13). The proportion of young genes showing lethality (3.3%) was slightly lower than the genome wide value (8.9%, http://bristlescreen.imba.oeaw.ac.at/data_summary.php). Among the orphan genes, 52 (from 84 lines) have knock-down data in the Bristle Screen database, with only 1 gene (from 1 line) being completely lethal (Additional file 15). Our results, of a low proportion of lethality in young genes, contrasts with a previous conclusion that young genes have a similar proportion of lethality as old genes , a result that might have been attributable to the off target effects of RNAi on duplicated genes, producing false positives for the essentiality of the young duplicated genes. More accurate experimental methods for knocking down/out genes in Drosophila are necessary to evaluate the essentiality of young genes. We assembled 18,385-26,178 new transcripts from the transcriptome data from 7 Drosophila species (Additional file 16). In Drosophila melanogaster, 145 of the newly assembled transcripts, from 133 genes, were identified as linage-specific lncRNAs that have no homology with transcripts in any other species. Among these new lncRNA genes, 129 were found to be significantly associated with 25 modules, with 6 of the modules, M14, M20, M42, M18, M3, and M46, significantly enriched with Drosophila melanogaster specific lncRNAs (P = 6.10E-31, P = 4.57E-04, P = 8.15E-12, P = 8.75E-04, P = 3.25E-07 and P = 3.82E-06, respectively, by the χ 2 test, after FDR correction) (Figure 3A, Additional file 17). Of these six modules, M14 is correlated with the adult male 30 days after eclosion stage (Figure 3D, Additional file 18), M20 was correlated with the pupae 12 hr after WPP (P = 1e-06, Figure 3C, s Additional file 19), M18 is correlated with pupae 2 days after WPP (P = 3e-24), M42 is corrected with stage L3 CNS (P = 9e-20), M3 is corrected with stage L3 Imaginal Discs (P = 3e-28), and M46 is corrected with heads of mated adult males 20 days post-eclosion (P = 8e-04, Figure 3B, Additional files 3 and 20). We then used the genes in each of the modules where lncRNAs are enriched to conduct a gene ontology analysis, which may suggest potential functions for the lncRNAs. For example, genes in module M14 are enriched in odorant binding (P = 2.98e-24, after FDR correction), sensory perception of smell (P = 1.03E-17, after FDR correction), olfactory receptor activity (P = 7.73E-15, after FDR correction) and neurological system process (P = 3.57E-06, after FDR correction), suggesting a potential function of some of the lncRNAs in regulating expression of sensory perception genes. In addition, genes in module M20 are enriched in the defense response (P = 0.047, after FDR correction), genes in module M18 are enriched in proteolysis (P = 0.035, after FDR correction), and genes in module M46 are enriched in photo transduction (P = 1.06e-23, after FDR correction) (Additional file 21), suggesting that lncRNAs may have regulatory roles in these processes. Although the functions of the lncRNAs remain unclear, co-expression data provides information that could be examined in future studies. Expression profile of lncRNAs in each module. (A) Enrichment of lncRNAs in each gene module. Stars show modules with significant enrichment in lncRNAs. (B-D) Histogram of the expression of genes in modules M46 (B), M20 (C) and M14 (D) and heatmaps of the expression of genes in this modules are seeing in Additional files 18, 19 and 20. 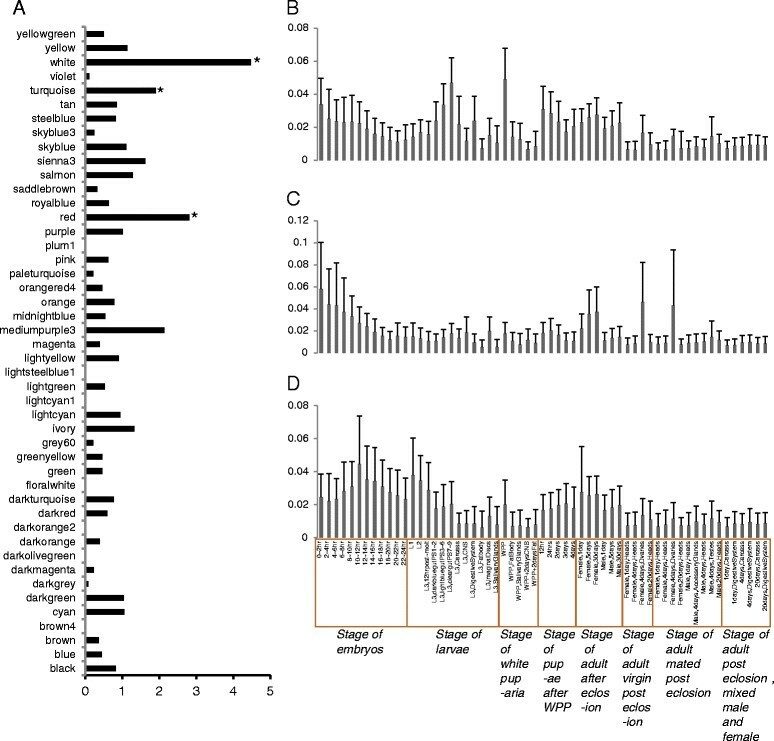 9,746 one-to-one orthologs among Drosophila melanogaster, D. annanassae, D. sechellia, D. yakuba and D. erecta were retrieved from the EnsemblMetazoa database (http://metazoa.ensembl.org). After alignment and trimming, 9,531 orthologs remained for use in the detection of positive selection employing the branch site model of PAML . A total of 263 and 383 Positive Selected Genes (PSGs) were identified in the Drosophila melanogaster and D. sechellia lineages, respectively. Of the one-to-one orthologs, 7,939 (from 13,784 lines) have knock-down data in the Bristle Screen database, with 929 (~11%) genes (from 1,291 lines) being completely lethal. Among the 263 PSGs, 216 genes (from 413 lines) with knock-down data in Drosophila melanogaster, with 36 of these genes (from 54 lines) being completely lethal (~13.08%) (Additional file 22). In Drosophila sechellia, among the 383 PSGs, 1 gene did not have detectable expression in the Drosophila melanogaster transcriptome datasets and 1 gene was placed in the non-sense module. The remaining 381 genes were distributed into 38 modules, with 40 (from 49 lines) of the 304 PSGs (from 553 lines) being completely lethal (Additional file 23). Excluding one gene that had no detectable expression in the transcriptome datasets, 262 PSGs in Drosophila melanogaster were distributed into 36 modules and were significantly enriched in M6 (P = 0.002196, by the χ 2 test, after FDR correction) (Additional file 22). Module M6 is significantly correlated with the 0-2 hr embryo stage (P = 4e-04), and this module is also significantly enriched with lethal genes (Figure 1C, Additional file 5). Enrichment of lethal genes also points to the importance of module M6. Among the 36 PSGs with completely lethality in Drosophila melanogaster, 18 are distributed to module M6. These data demonstrate that PSGs have essential functions, although they show rapid evolution with amino acid sequence changes driven by positive selection. Early developmental stages are very important for establishing phenotypes of later stages. Based on our gene co-expression network analysis, we observed that the non-random distribution of essential genes at early developmental stages in Drosophila development leads to different developmental stages showing varying levels of essentiality. For example, the 0-2 hr embryonic stage, which is the maternal to zygotic transition period in Drosophila, has enriched expression of essential genes, suggesting that the contribution of gene expression of these genes in this period of developmental time is important for phenotype evolution in Drosophila. Similarly, we found that the expression of new genes, including young protein coding and lncRNA genes, are also not randomly distributed during early development, and is significantly enriched in modules that correlate with specific developmental stages. This also suggests that these new genes also play roles in the evolution of specific phenotypes. New genes provide crucial material for evolutionary innovation, and evidence has been accumulating supporting the remarkable phenotypic effects of new genes in development. A pioneering study by Chen et al (2010) found that many new genes rapidly evolve essential functions in Drosophila, as the knockdown of expression many of these new genes by RNA interference (RNAi) leads to lethality at various stages of Drosophila development . Enrichment of new genes in early developmental stages supports a role for adaptive function by new genes at early developmental stages. For example, in human, the recruitment of young genes into the early developmental stages of neocortex was found to account potentially for the evolution of cognitive ability . Many studies have found a remarkable divergence between related species both in their early and late development, which is consistent with the hourglass model of development, although it has been proposed by others that genes expressed in early stages of development should be highly conserved . Recruitment of newly originated genes at early stages of developmental might allow evolution of specific phenotypes, while conserved genes retain function for the conserved core of development. With the advent of large-scale genomic data, large numbers of positively selected adaptive mutations in the coding sequences of genes involved in the evolution of phenotypes, including morphological and physiological traits, have been identified . Here, positively selected genes showing rapid amino acid sequence change specific to the Drosophila melanogaster lineage were identified, with some of these genes found to be essential as knock-down leads to lethality. The correlation between evolutionary rate and essentiality of genes is weak , where gene essentiality tends to be associated with adaptive evolution in protein sequence. Although, the functional shifts caused by amino acid changes in PSGs are often unclear, mutations driven by positive selection appear to contribute significantly to the evolution of the phenotypes generated by the PSGs. Enrichment of PSGs among gene co-expression modules correlated with early developmental stages supports the hypothesis that changes in the amino acid sequences of PSGs leads to phenotypic evolution. Young genes, including duplicated, orphan, and young lncRNA genes, are significantly enriched among modules associated with specific developmental stages. In addition, genes undergoing rapid amino acid sequence evolution driven by positive selection showed a similar proportion of essentiality with other genes, and enrichment at module of specific developmental stages. Our integrative analysis revealed important roles for the origin of new genes and rapid amino acid sequence evolution in development that may account for specific phenotype evolution in Drosophila melanogaster to some extent. Transcriptome data for Drosophila melanogaster, including 27 distinct developmental stages and 12 tissues from different development stages , and data from six other Drosophila species (D. ananassae, D. mojavensis, D. pseudoobscura, D. simulans, D. virilis, and D. yakuba) were downloaded from the SRA database (http://www.ncbi.nlm.nih.gov/sra/) (Additional file 1). Transcriptome raw read data, in sra format, was converted to fastq using the SRA Toolkit (available at http://www.ncbi.nlm.nih.gov/Traces/sra/?view=software), and trimmed with Btrim . Tophat  (v2.0.4) was implemented to align the reads, by default, and Cufflinks (v 2.0.2) was used to assemble transcripts with the –g parameter. Cuffcompare was used to generate an integrated combined gtf annotation file along with the Ensembl annotation file. New transcripts with class codes “c, j, e, i, o, u, x”, having more than 2 exons, lengths longer than 200 bp, and expression levels from FPKM values higher than 1.0 in at least one sample, were retrieved, and merged with the reference annotated gtf file. The merged gtf file was used as input for Cufflinks to calculate expression values for each gene with the –G parameter. The coding potential of transcripts from the newly assembled loci was evaluated by the coding Potential Calculator (CPC) , and values lower than -1 were considered to be noncoding. All transcripts in the other Drosophila species (D. ananassae, D. mojavensis, D. pseudoobscura, D. simulans, D. virilis, and D. yakuba), including annotated cDNA and newly assembled transcripts, were merged. Drosophila melanogaster lncRNAs were used as the queries for BLASTN searches against the merged cDNA with a cutoff e-value 1e-10 . Drosophila melanogaster lncRNAs without homologous hits in the other species were treated as Drosophila melanogaster specific. WGCNA (weighted gene co-expression network analysis) package implemented in R  was used to construct a weighted gene network based on the expression values calculated above. The power of 8, for which the scale-free topology fit index curves flatten out at roughly 0.9, were interpreted as a soft-threshold for the adjacency matrix. In total, 46 modules were identified. Unassigned genes, 37genes, were placed into the “grey” module (module M47). Module membership, defined as the Pearson correlation between the expression level of a given gene and a given module eigengene was calculated to identify intramodular hub genes. Modules whose eigengenes (referred to as the first principal component) were highly correlated with different biological stages were merged. Each module was summarized by a single representative expression profile, which was referred to as the module eigengene. The module eigengene is a more complete representation of gene co-expression relationship in each network. We correlated eigengenes with various developmental stages to access the association between a module and a developmental stage. For example, a correlation, like 0.97, indicates a high association between one gene co-expression network and one developmental stage. 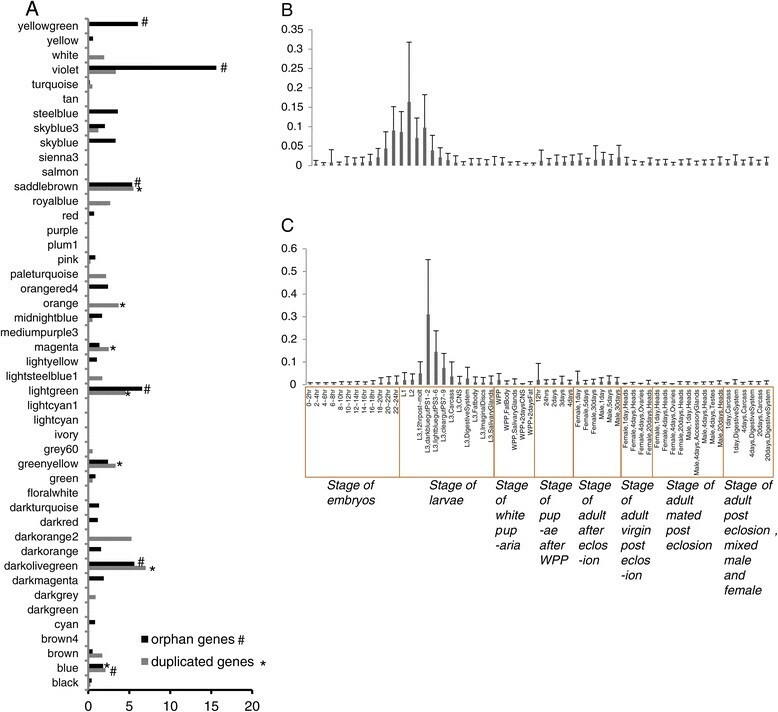 Ages of genes in Drosophila melanogaster were retrieved from ProteinHistorian . ProteinHistorian estimated gene ages by making use of different ancestral family reconstruction algorithms and pre-existing protein family database and phylogenetic trees. Duplicated genes in Drosophila melanogaster were retrieved from Ensembl using Biomart . However, Ensembl database dates when the duplication occurred, but does not provide information that which gene is the source copy and which is the derived copy. Here, we defined young duplicated genes (derived copies) as these duplicated genes with an age of 0 induced by ProteinHistorian. Protein sequences in Drosophila melanogaster were used to BLASTP against the protein database of other Drosophila with an e-value 1e-10  (1e-3 and 1e-4 were used and the results, seeing in Additional files 24 and 25, were very similar with 1e-10). The genes in Drosophila melanogaster having no homologous hits in the other species were treated as orphan genes. Orthologous_one2one genes among melanogaster group: Drosophila sechellia, D. menlanogaster, D. yakuba, D. erecta, and D. ananassae were retrieved using Biomart from EnsemblMetazoa (http://metazoa.ensembl.org). PRANK (available at http://www.ebi.ac.uk/goldman-srv/prank/prank/) was used for multiple sequence alignments at the codon level. 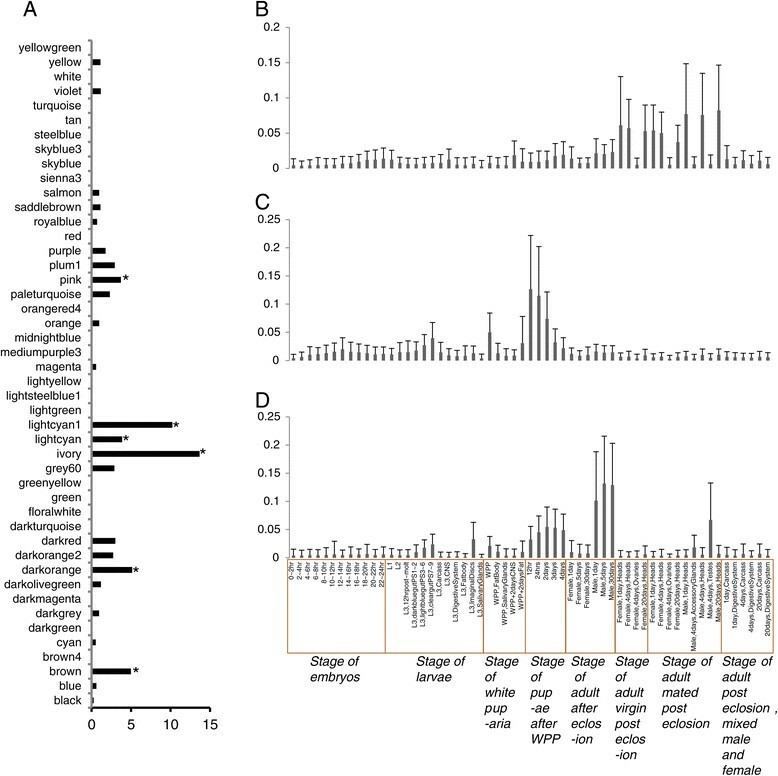 To obtain high quality sequence alignments, the longest transcript of each species was chosen when genes had more than one transcript and sequencing errors and non-orthologous sequences were removed using an in-house script. Only alignments with lengths longer than 30 codons were retained. The accepted phylogenetic relationship of the melanogaster group was used (((Drosophila schellia, D. melanogaster), (D. yakuba, D. erecta)), D. ananassae). The CODEML algorithm from the PAML4 package  was used to detect positive selection utilizing the branch-site model . The Database for Annotation visualization and Integrated Discovery (DAVID) was used to investigate the enrichment of Gene Ontology (GO) terms and KEGG pathways . In order to avoid a selection bias, we also performed the GO analysis using the goseq  package (http://www.bioconductor.org/packages/release/bioc/html/goseq.html) in R (v-2.15.3). The analysis was corrected for the length of Drosophila melanogaster reference genes. FDR correction was performed using the package “multtest” (available in http://www.bioconductor.org/packages/release/bioc/html/multtest.html) with the parameter “proc = BH”. This work was supported by grants from the National Natural Science Foundation of China (31271339 and 31321002). DDW and YPZ designed the study. HQL and YL performed analysis. HQL, DDW wrote the manuscript, DMI made substantial intellectual contributions to the project. All authors read and approved the final manuscript.